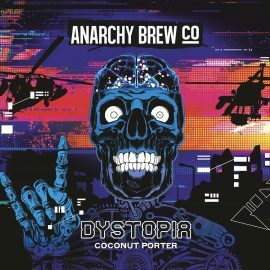 New Beer: Dystopia Coconut Porter - Anarchy Brew Co.
Our new beer, Dystopia, launches next week. A coconut porter, with coconut (obvs! ), chocolate, and a hint of tonka bean. And at 4.8% ABV, it’s very easy to drink! Track it down in all good pubs and bottle shops at the end of next week. Dystopia will also be pouring in our taproom on Friday and Saturday next week, alongside our Craft Beer Hour 789 guest beers from Blackened Sun Brewing Co.